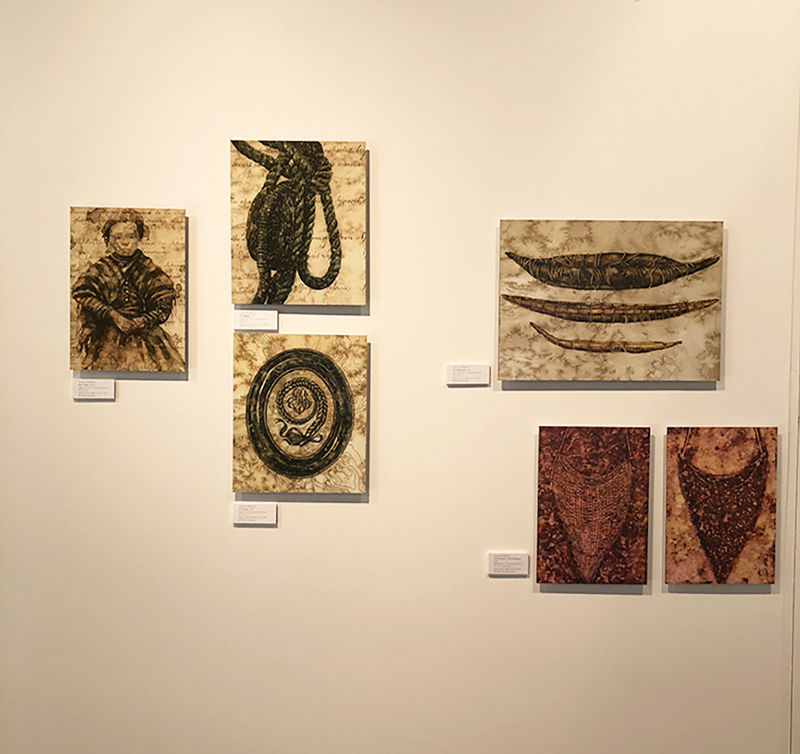 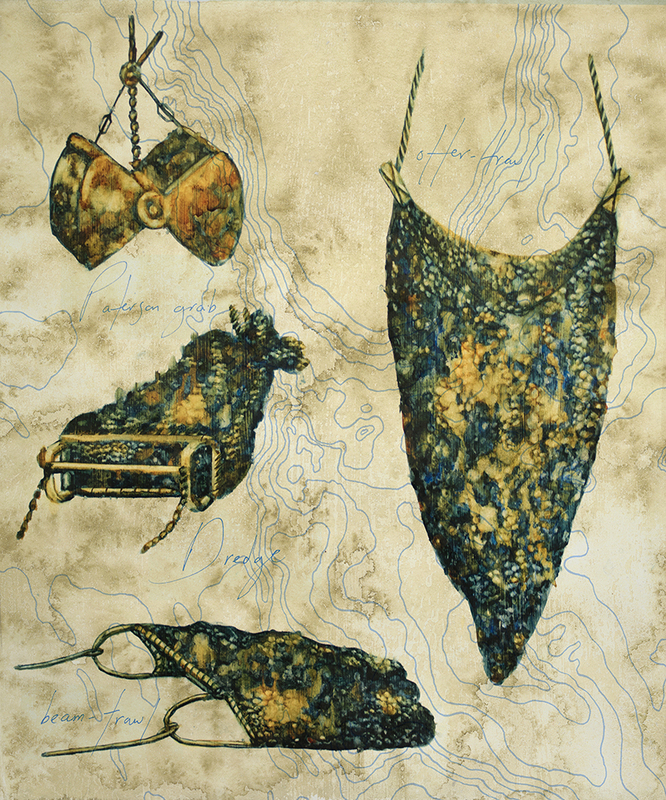 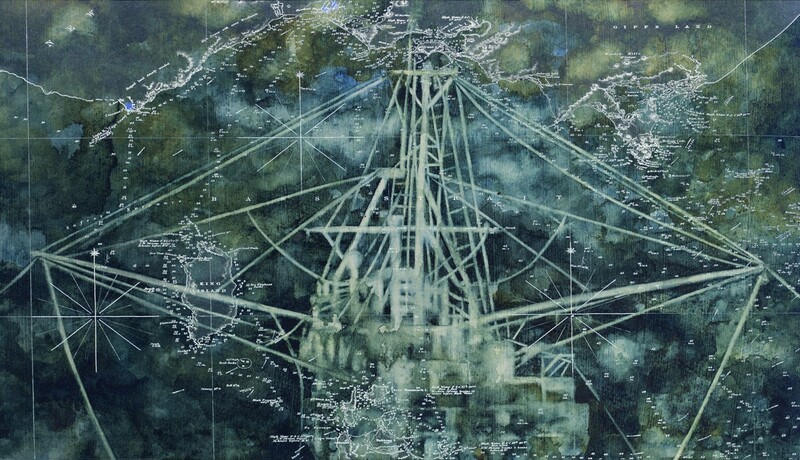 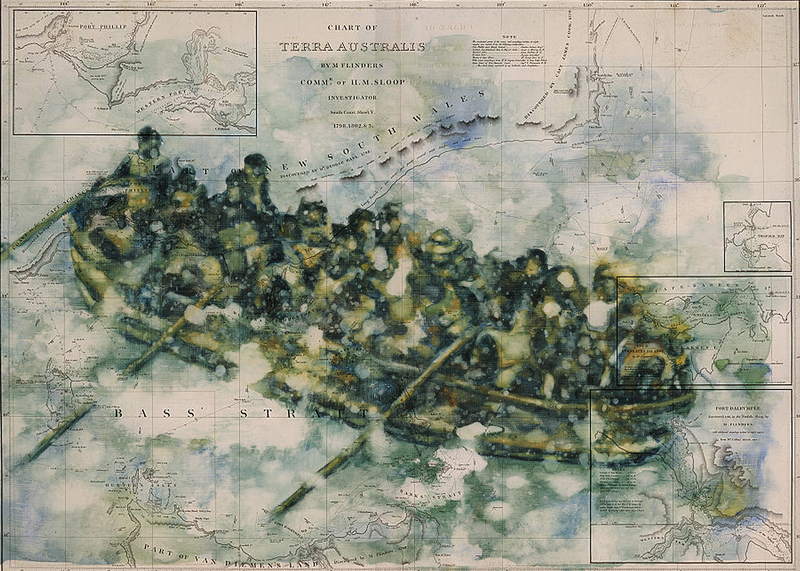 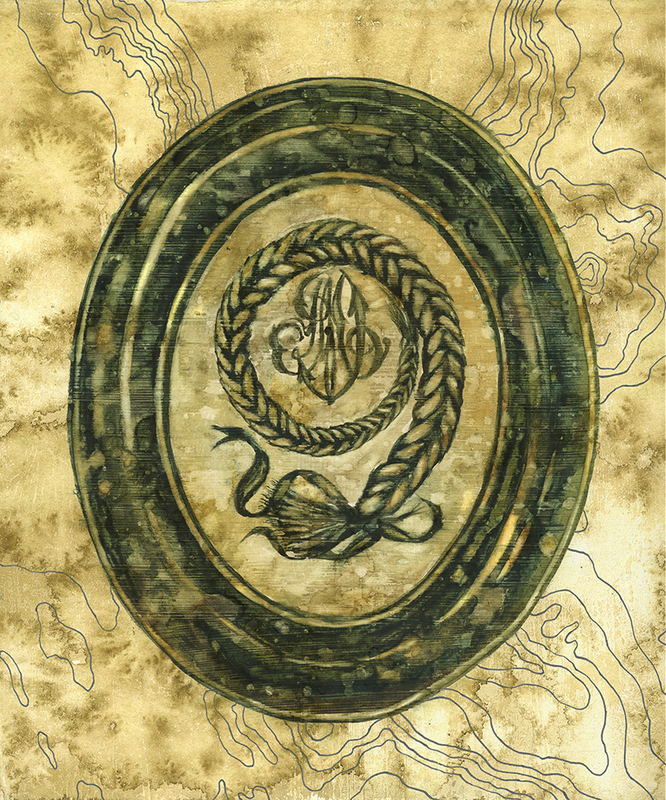 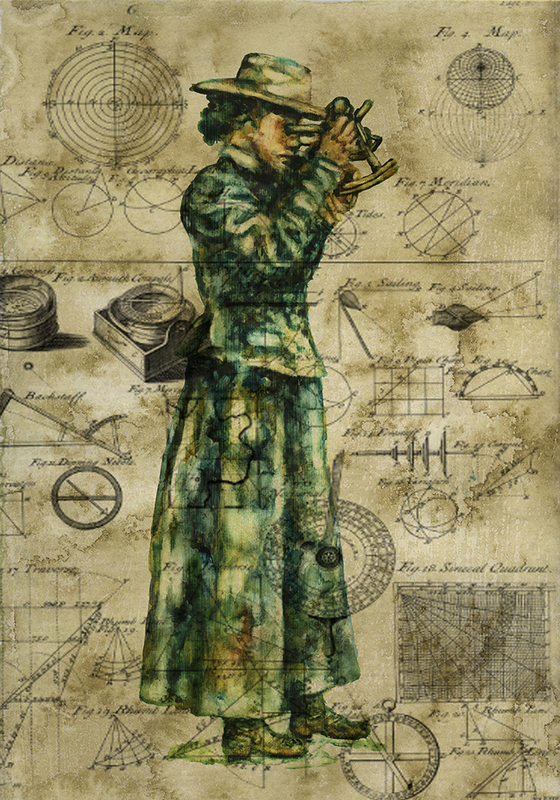 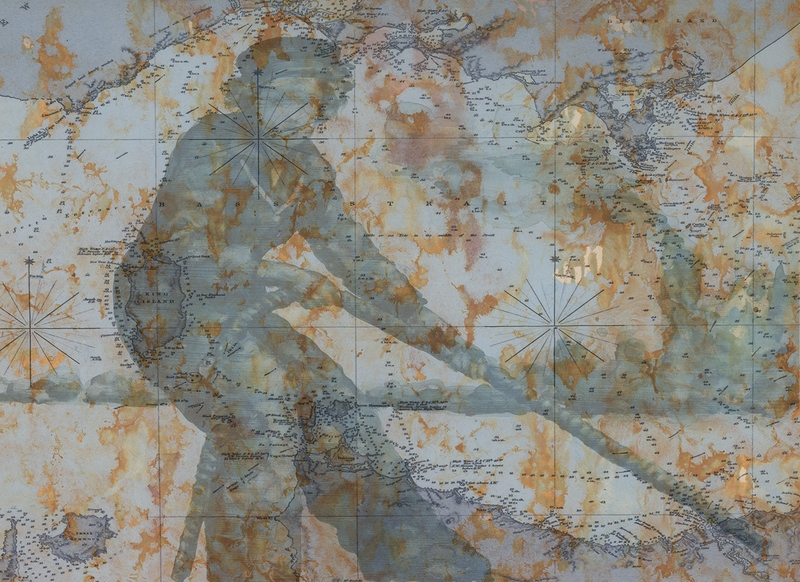 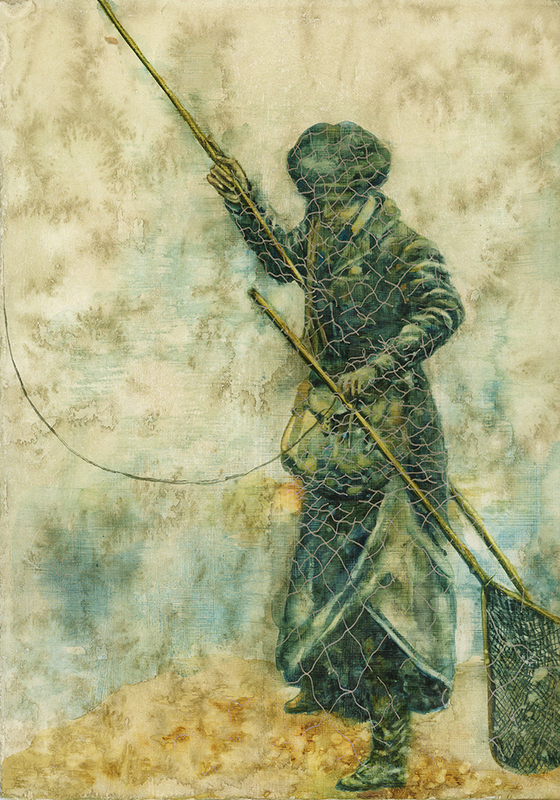 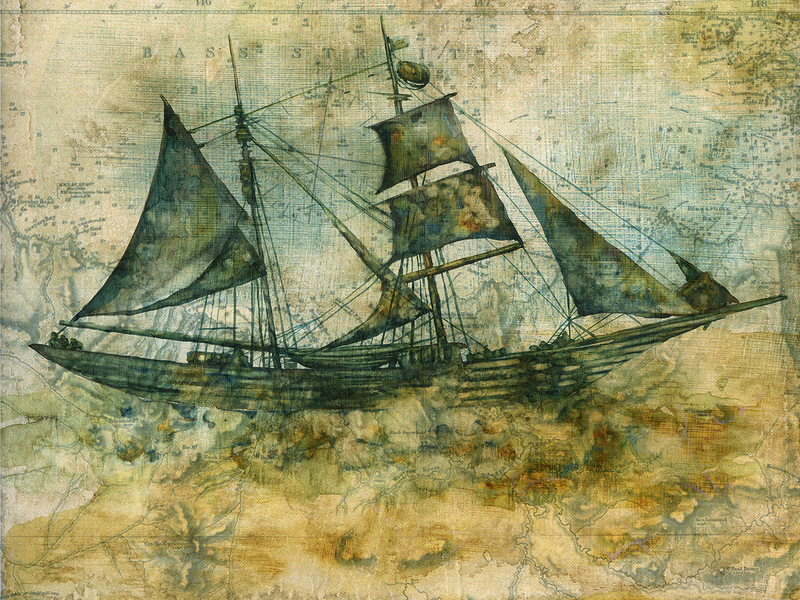 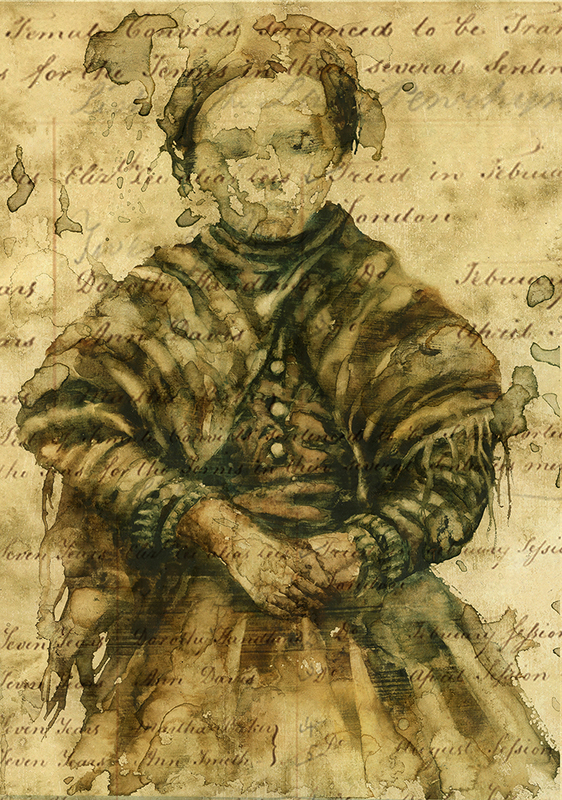 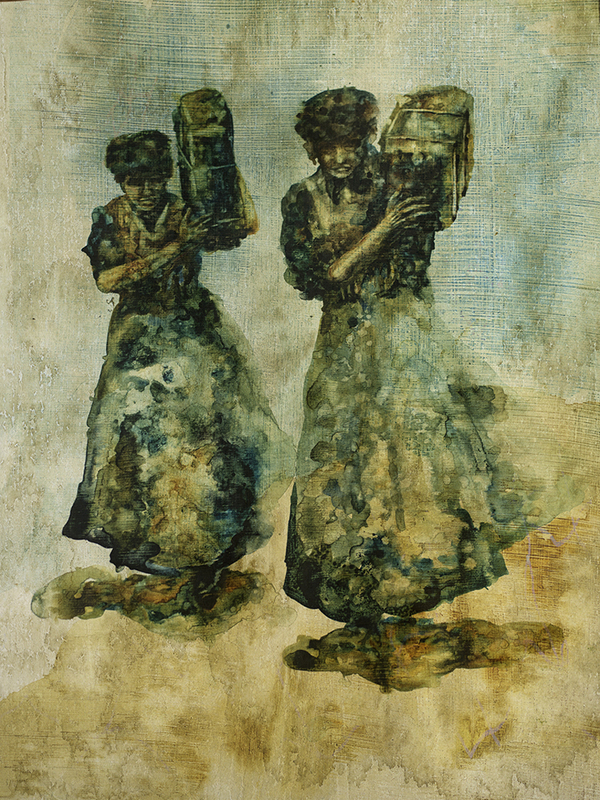 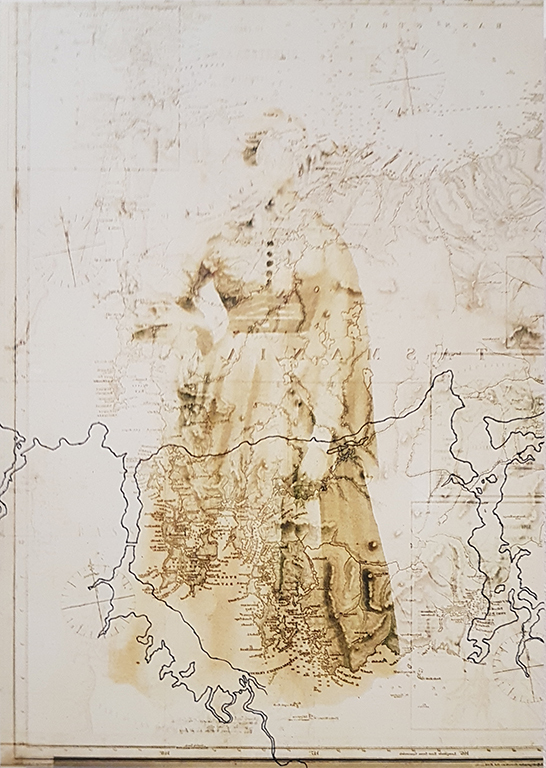 Despard is proud to present Anne Morrison’s new exhibition The Crossings, where she explores the lost female stories in our Maritime History. 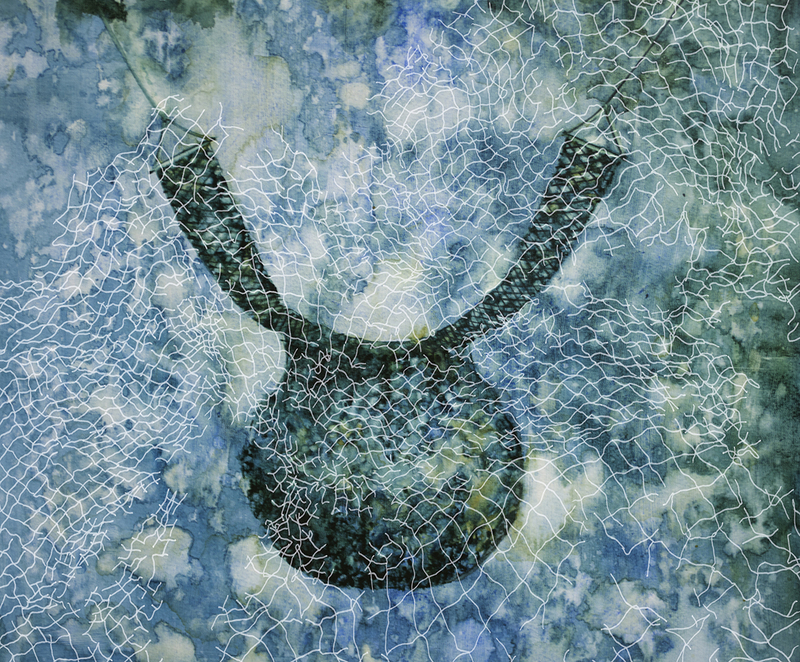 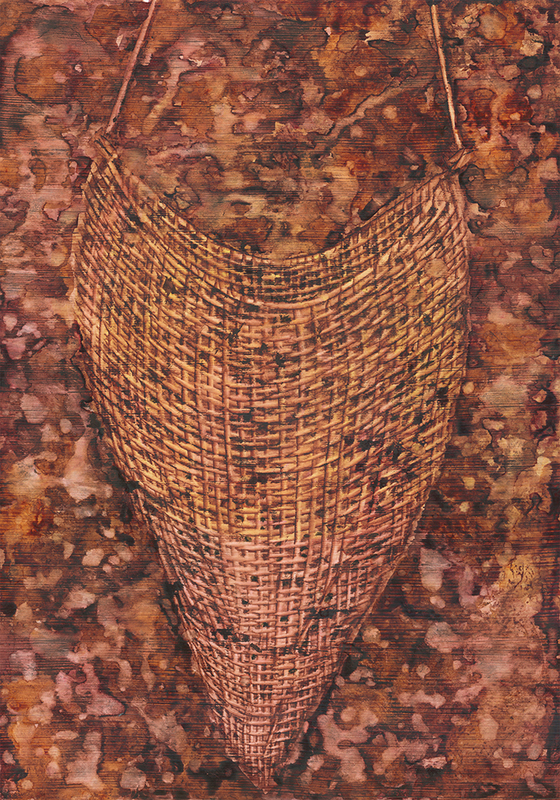 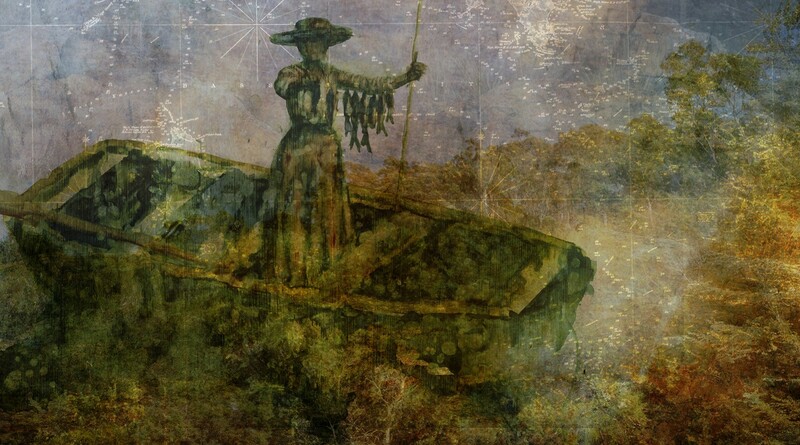 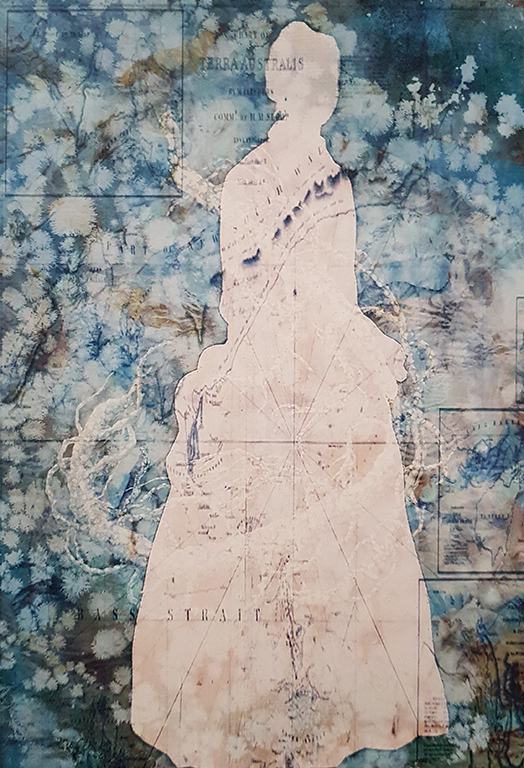 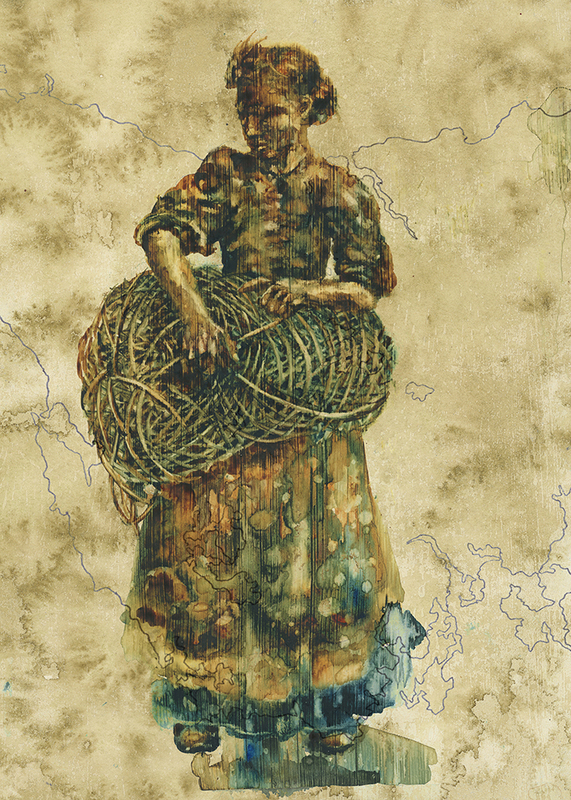 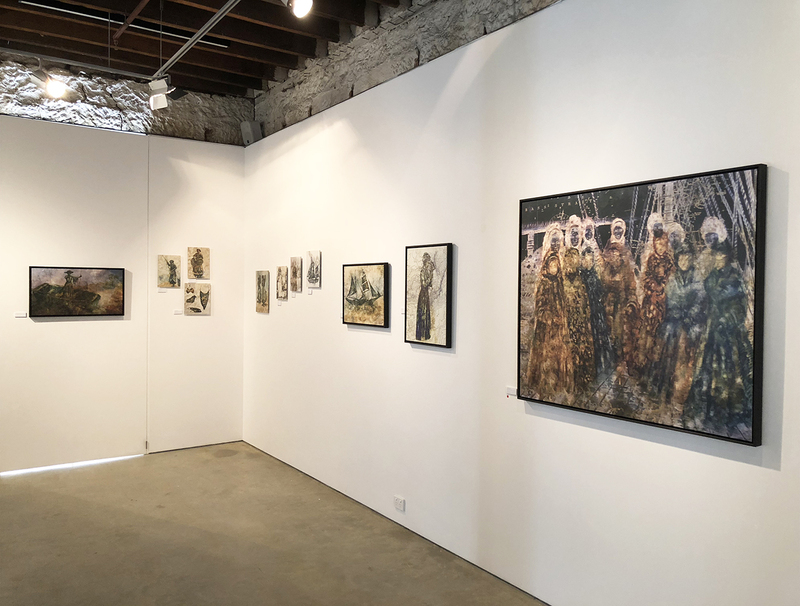 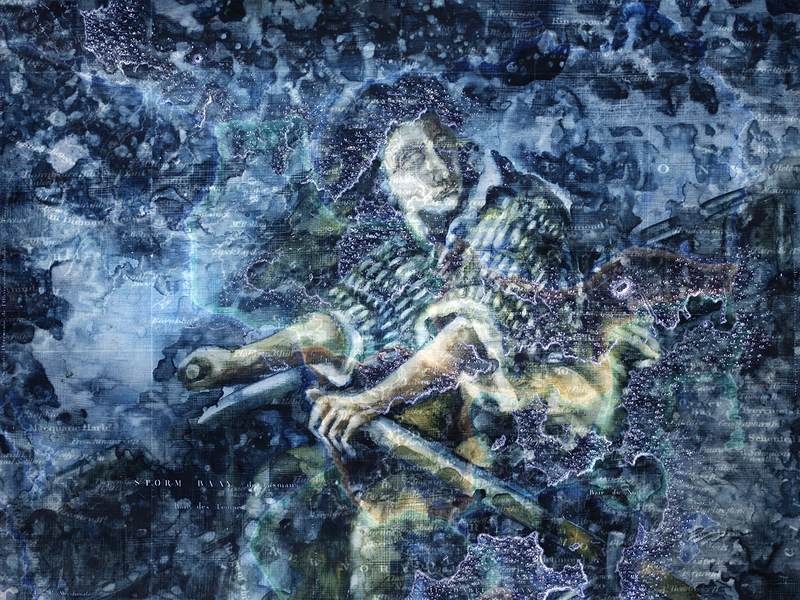 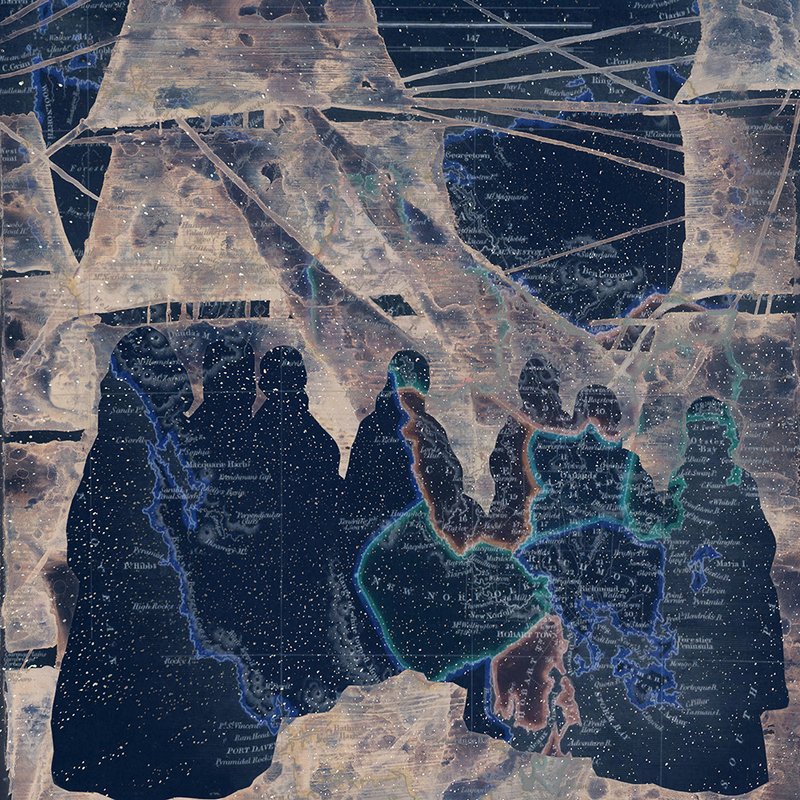 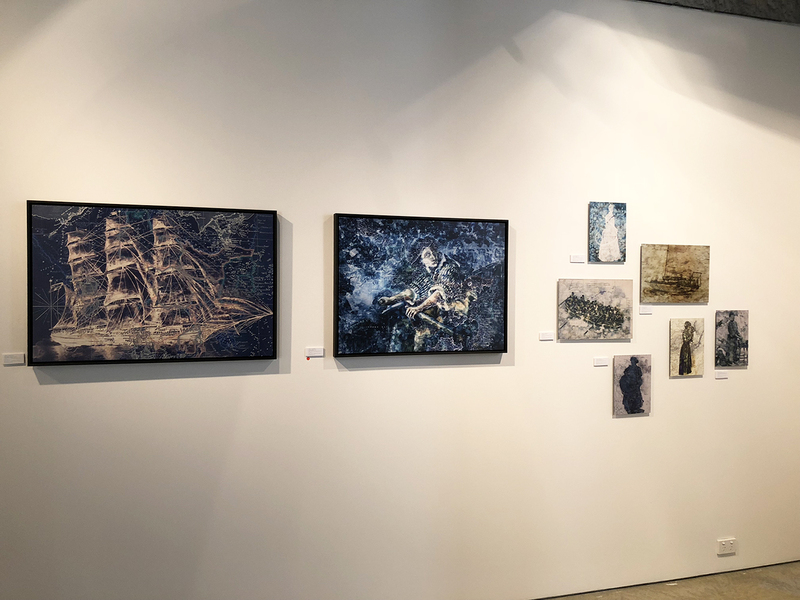 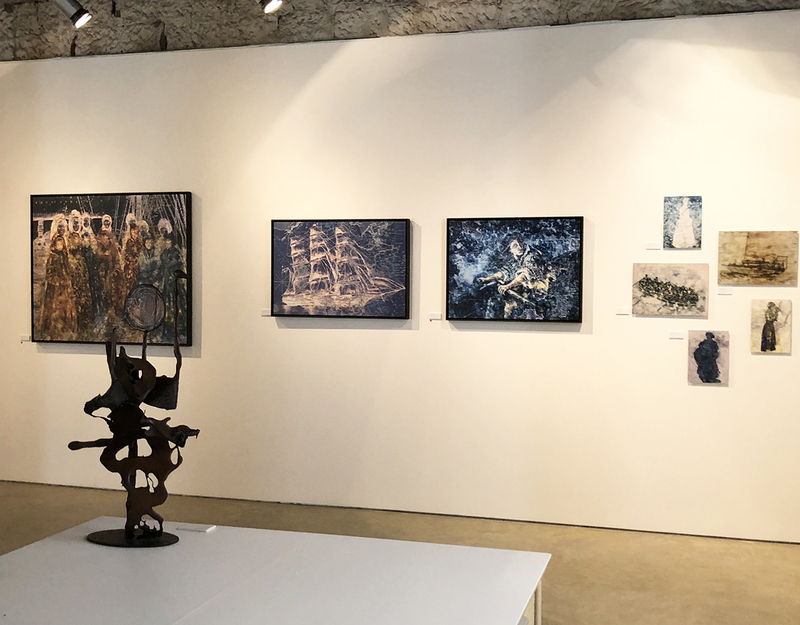 ‘The Crossings’ comprises a suite of digital prints based historical and contemporary photographs of women, boats and artefacts associated with the sea, rivers and waterways. 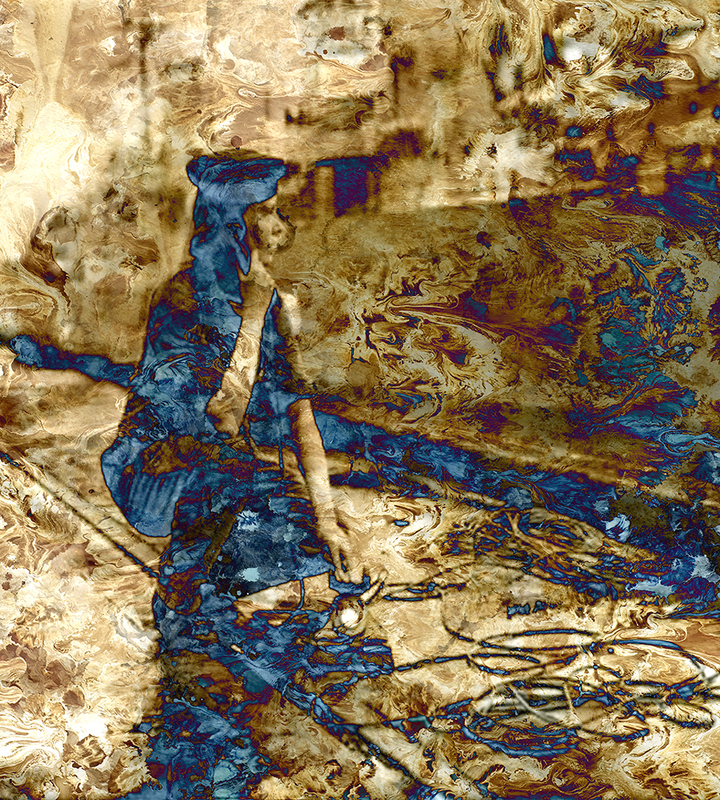 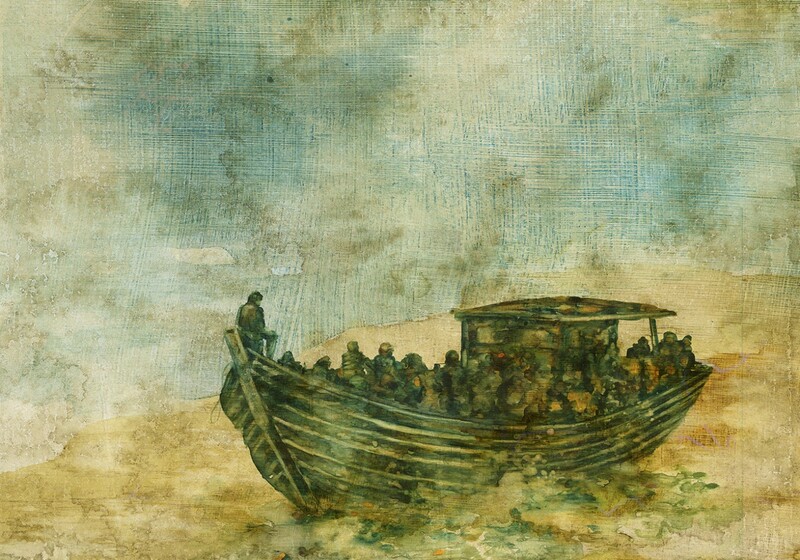 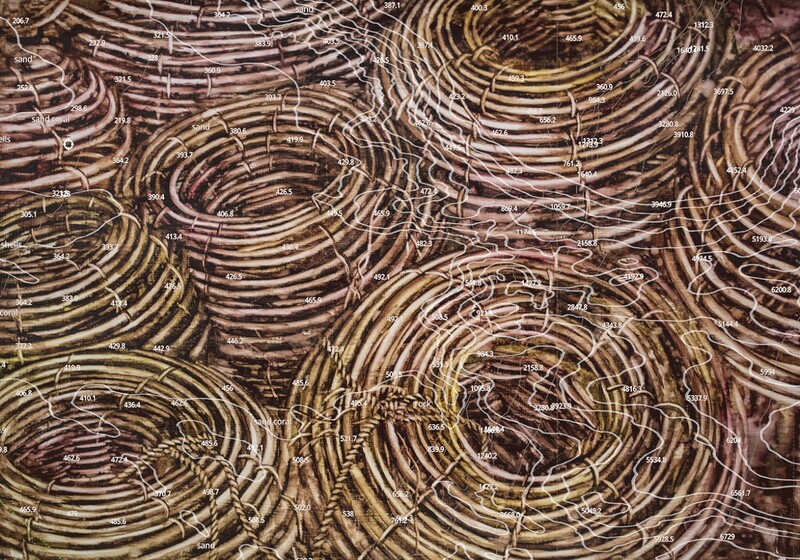 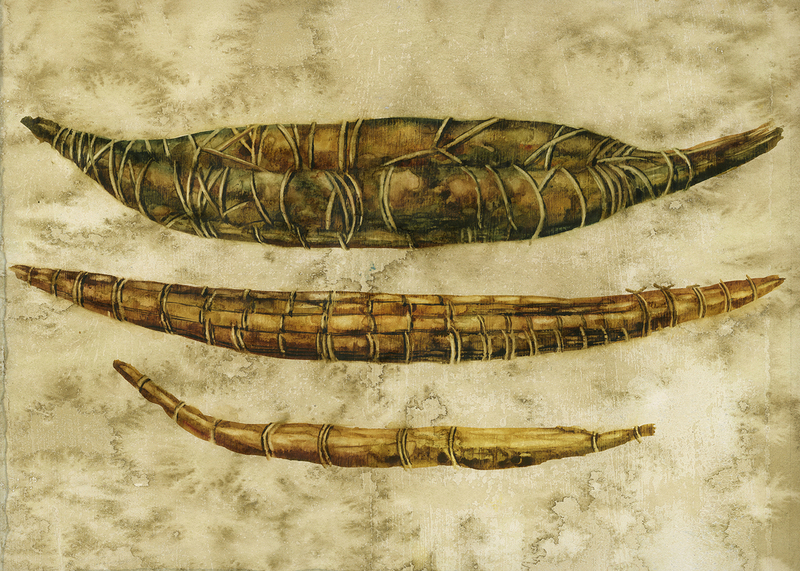 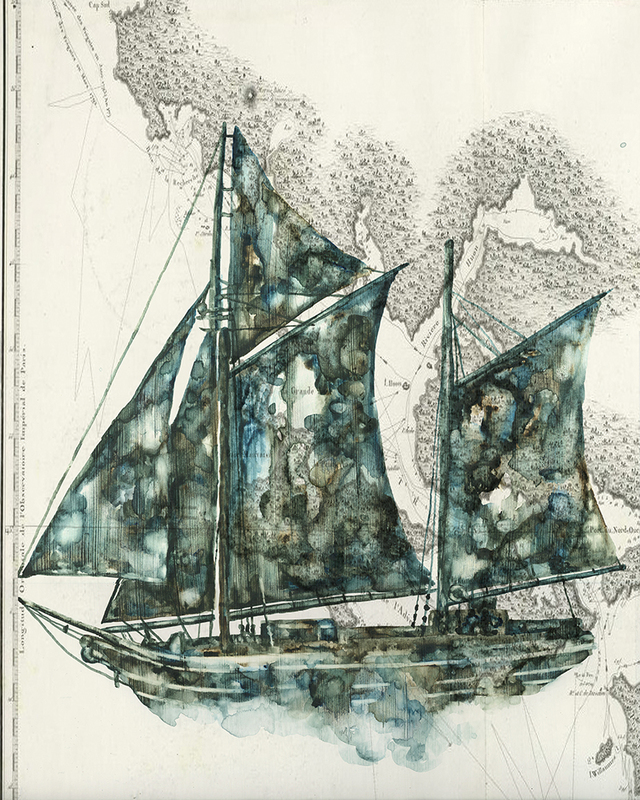 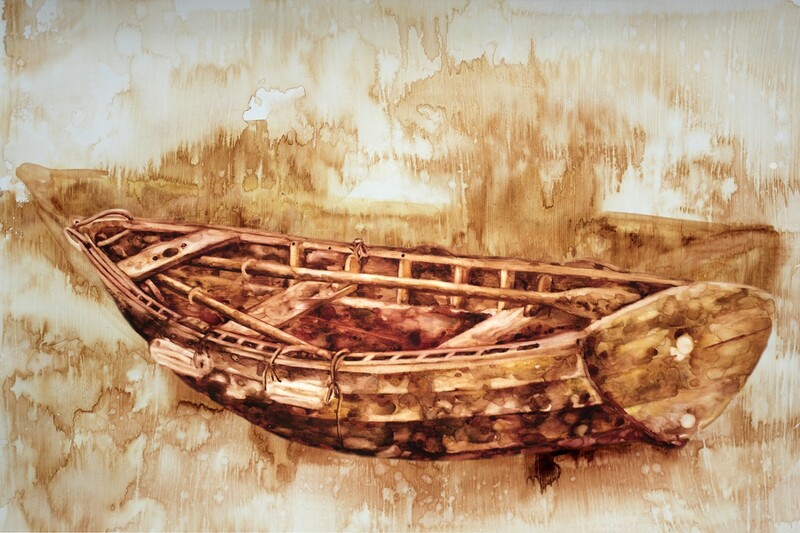 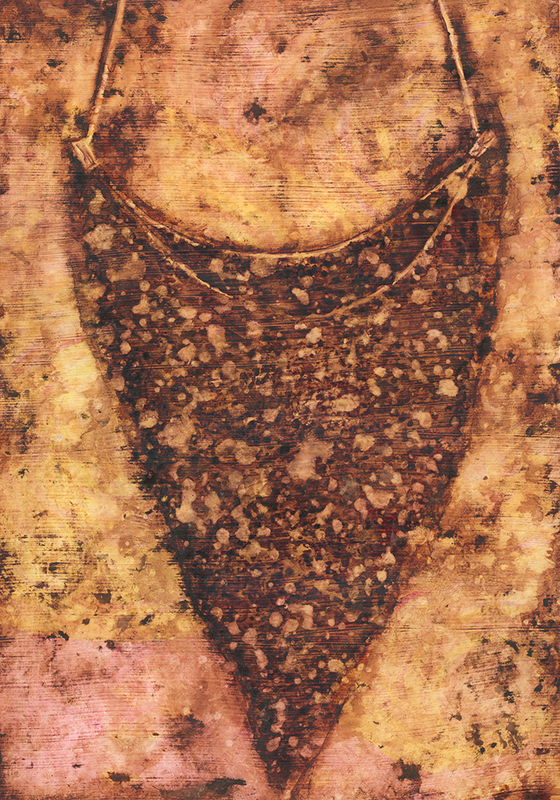 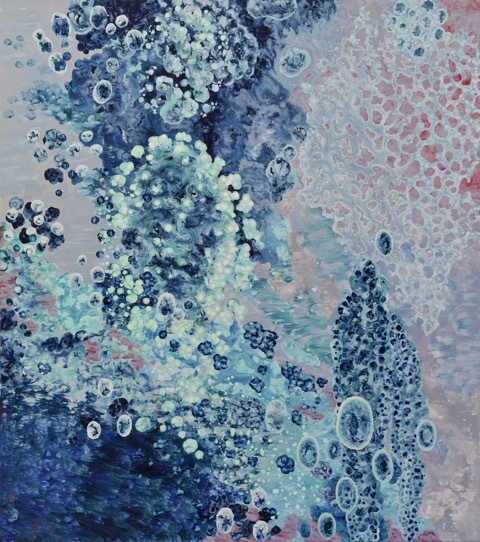 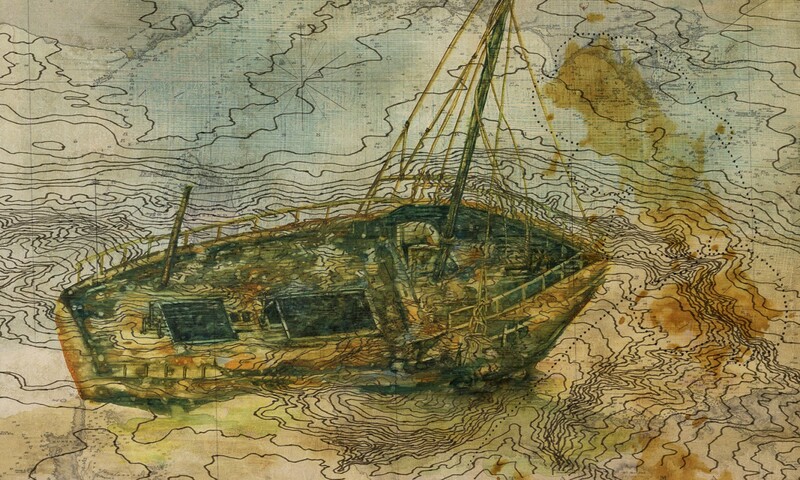 Watercolours are layered with detailed drawings and digital manipulation techniques. 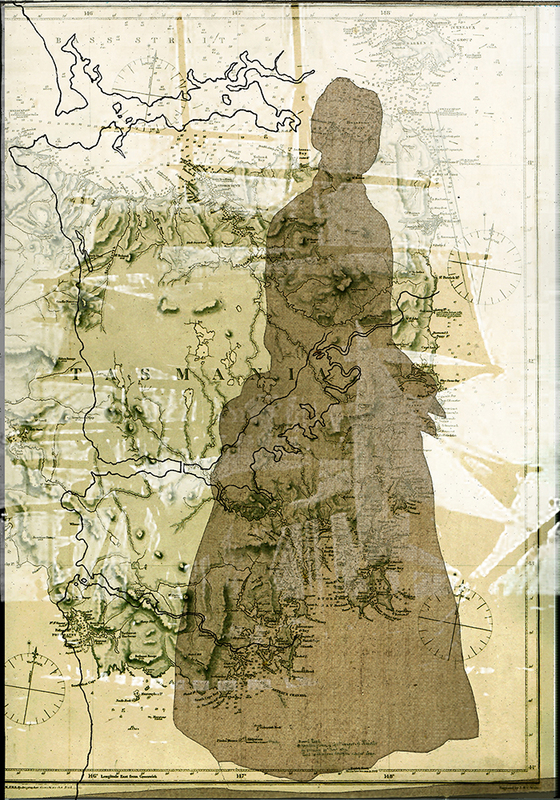 People and places seem to fade in and out of view, in an attempt to suggest the experience of sifting through recorded history. 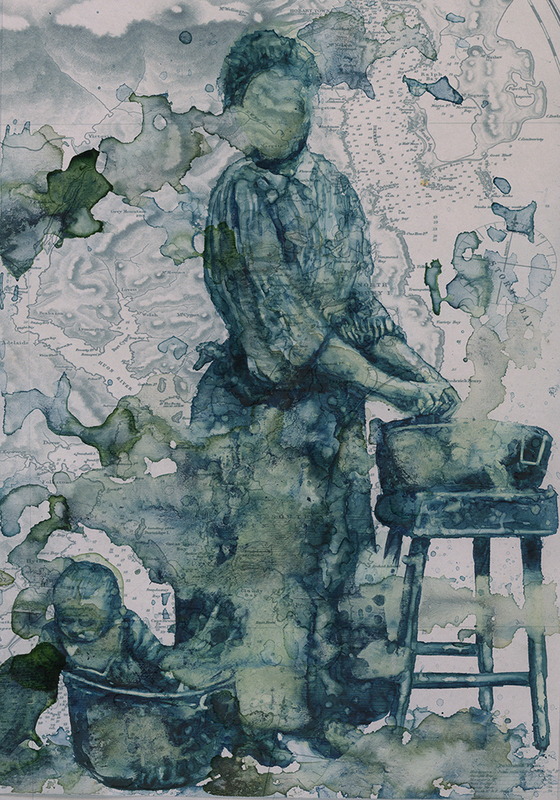 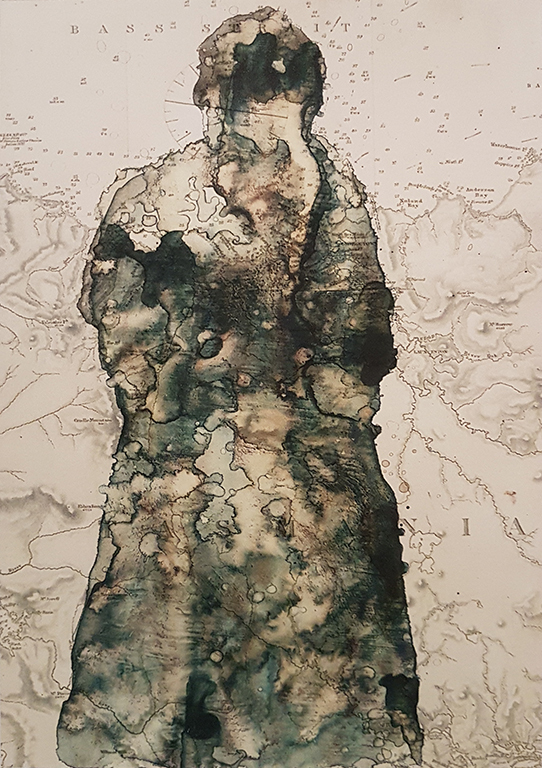 Fluid watercolours flood the surface of primed paper and as the water evaporates Morrison works back into the patterns left behind seeking to evoke a sense of presence through absence as the figures and objects remain visible only as a subtle trace, a watermark. 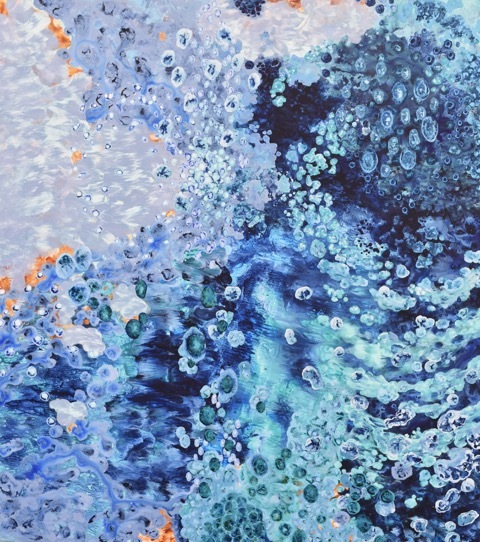 Droplets of pigment disperse through streams of water creating tributaries relating to the ebb and flow of the tides, nets and networks. 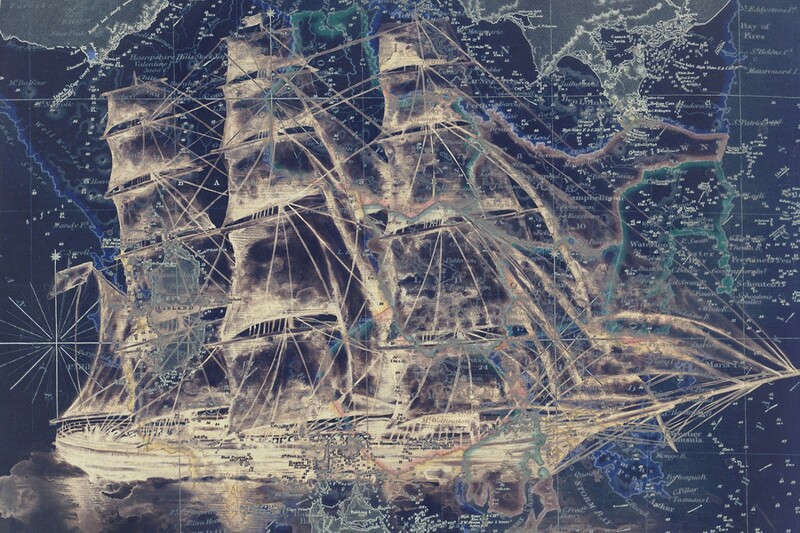 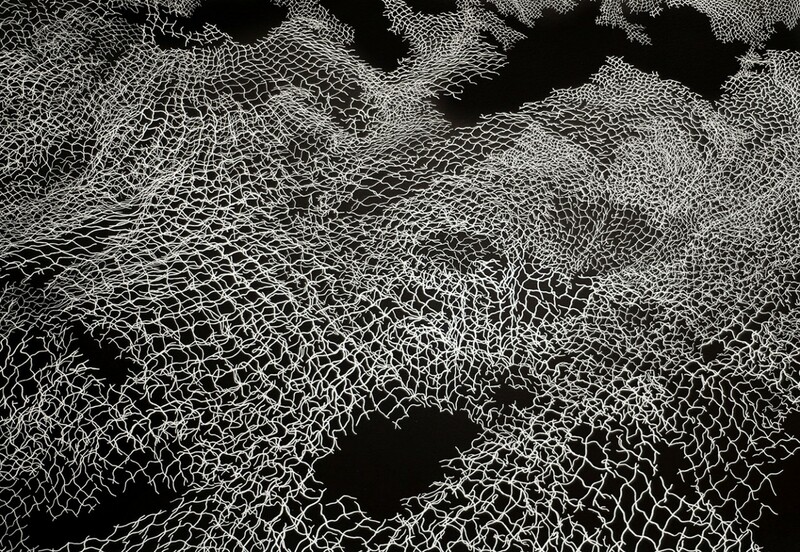 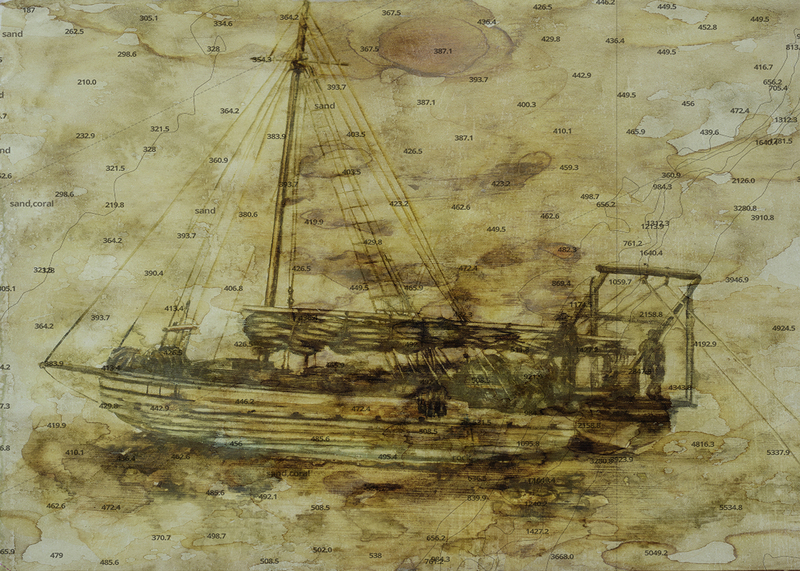 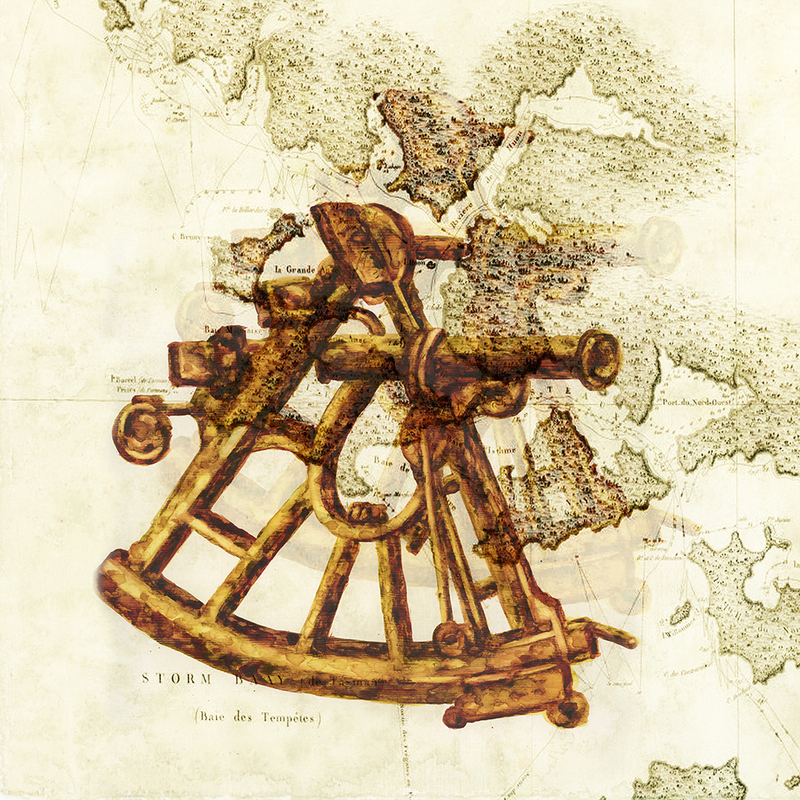 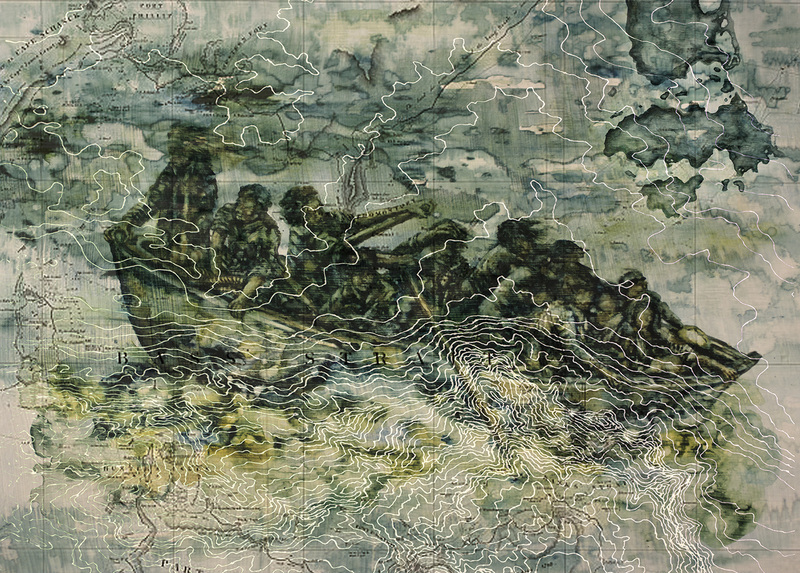 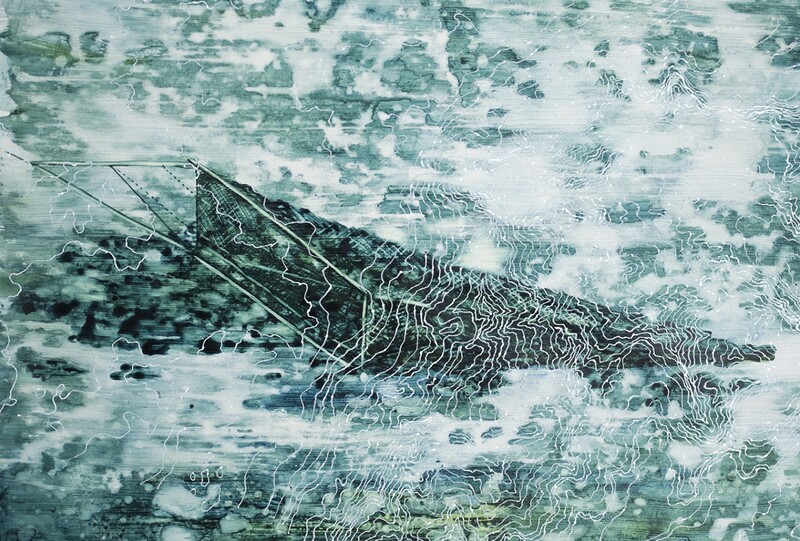 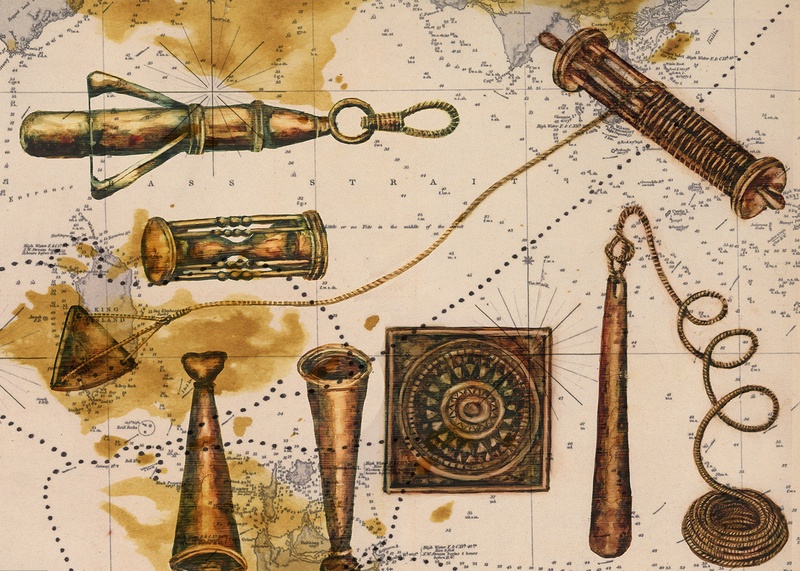 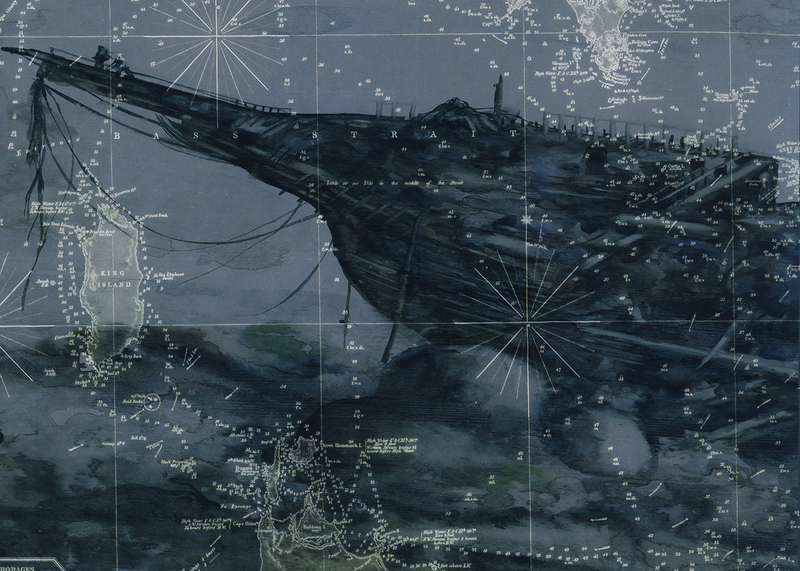 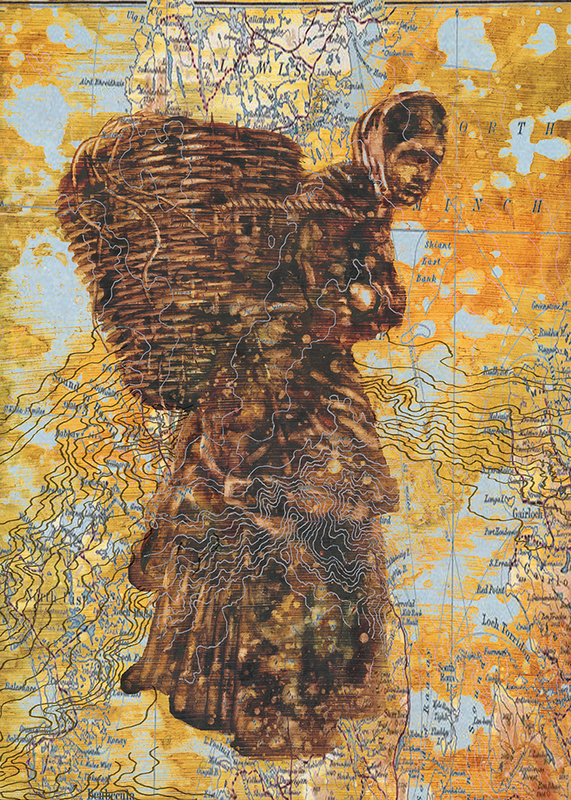 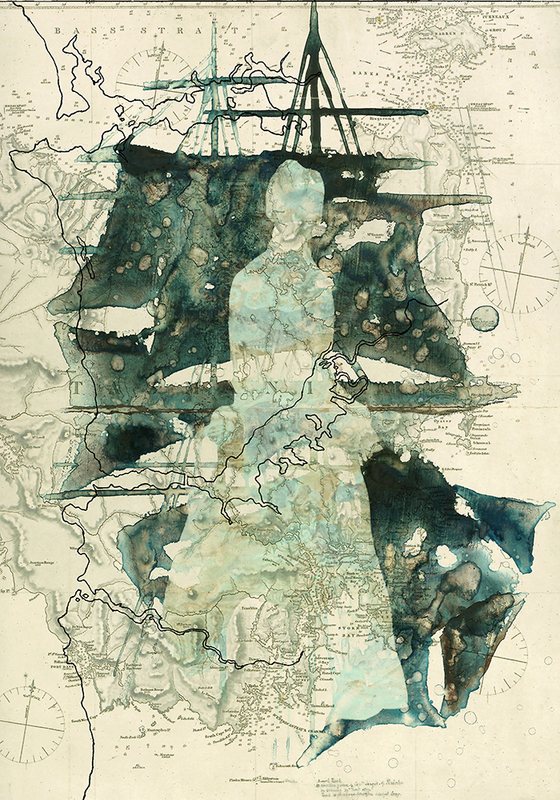 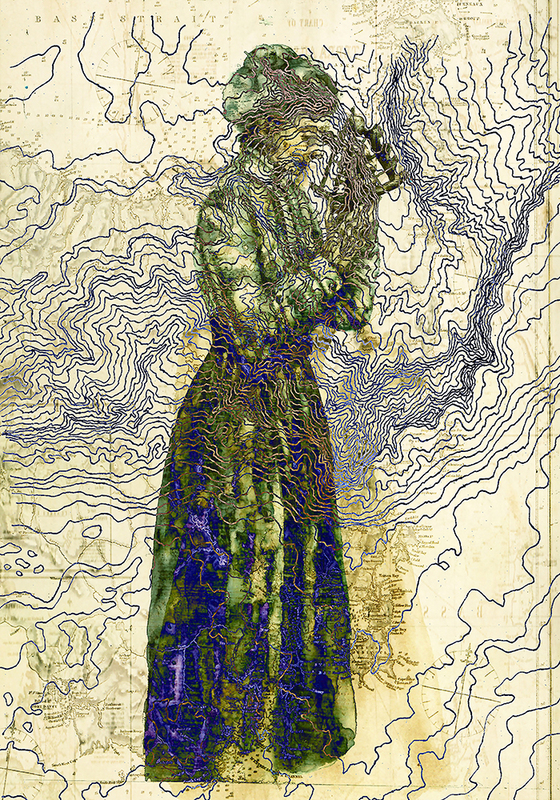 Fine line drawings of and references to historical maps, bathymetric charts and photographs are layered behind and over the figures and objects. 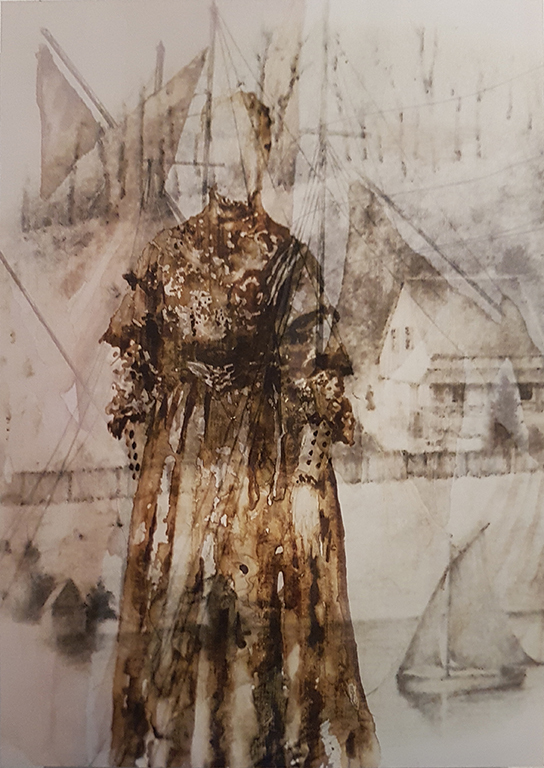 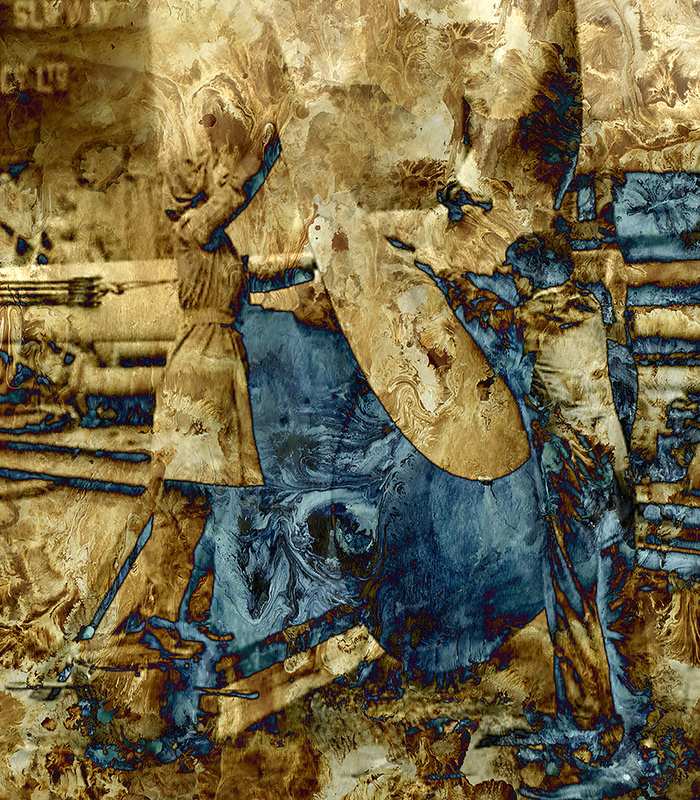 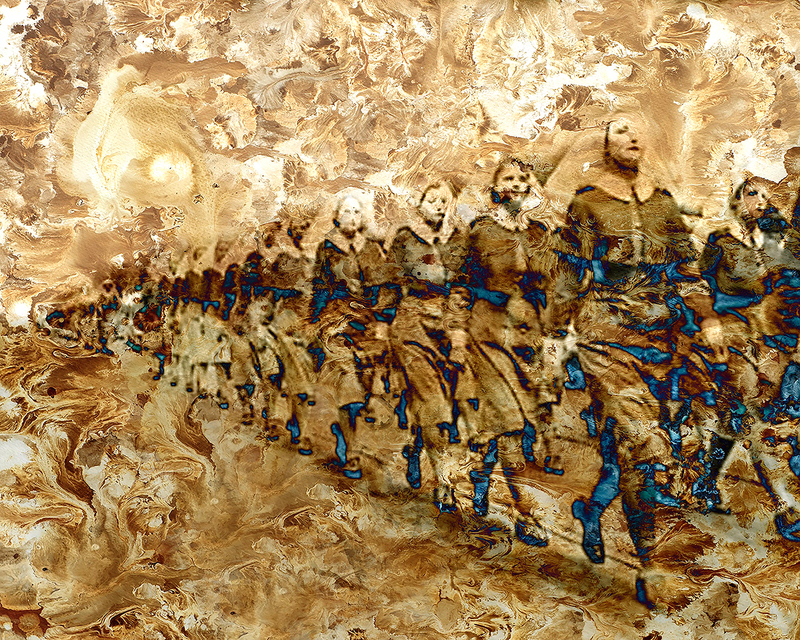 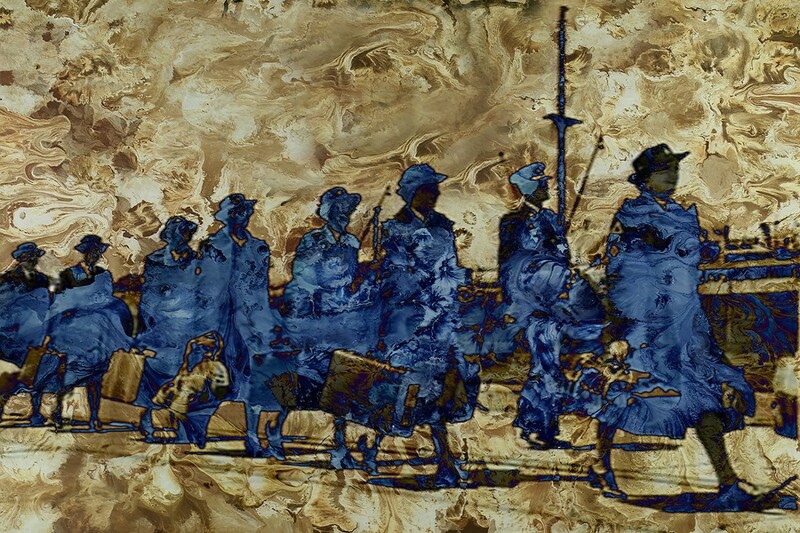 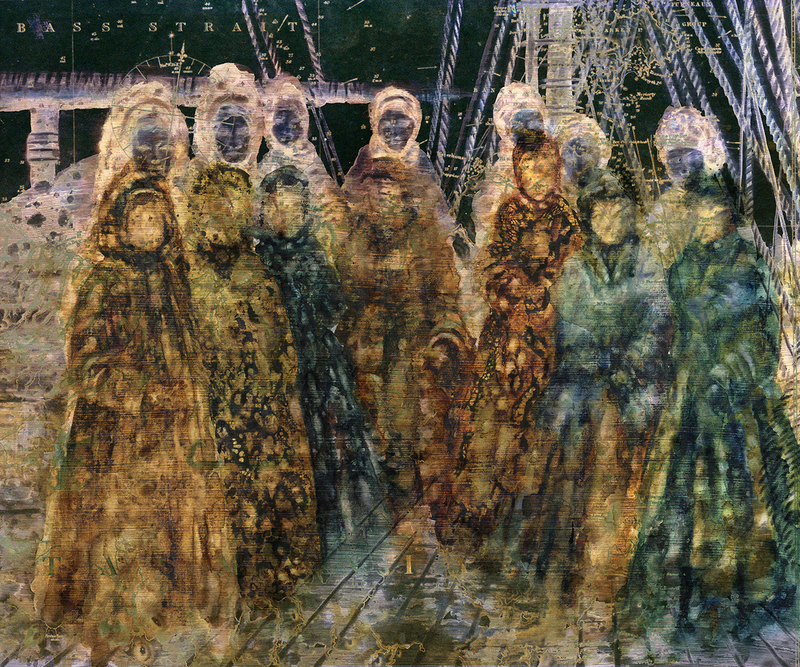 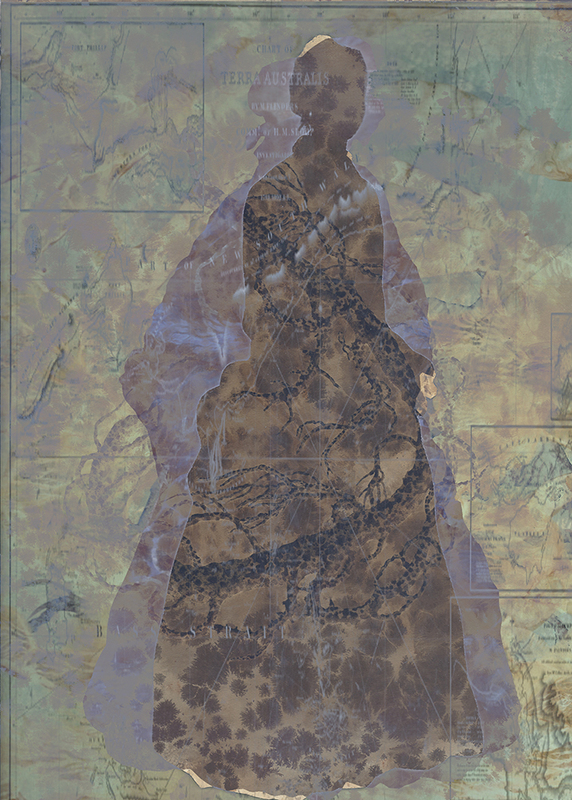 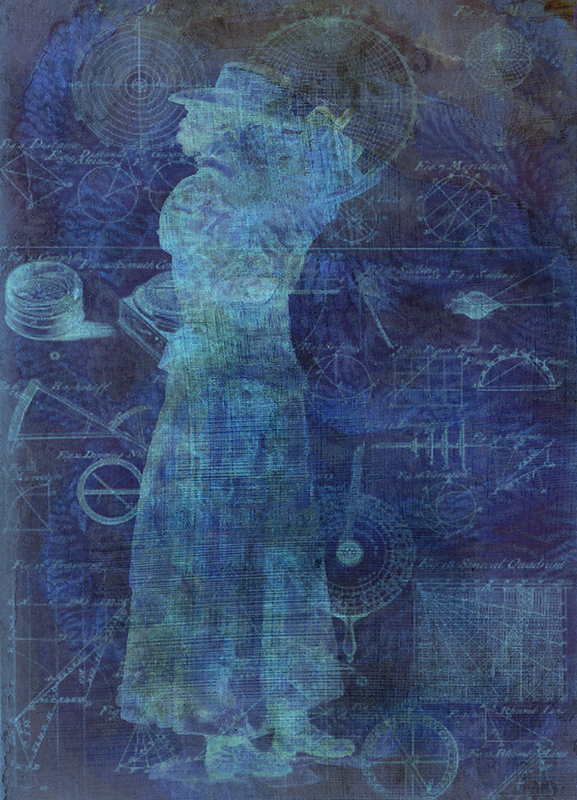 This process of layering and re-layering visual information digitally, echo how easily fragments of history can be lost and buried, and yet sometimes something is found; a trace, an object, an image that reconnects the past to the present. 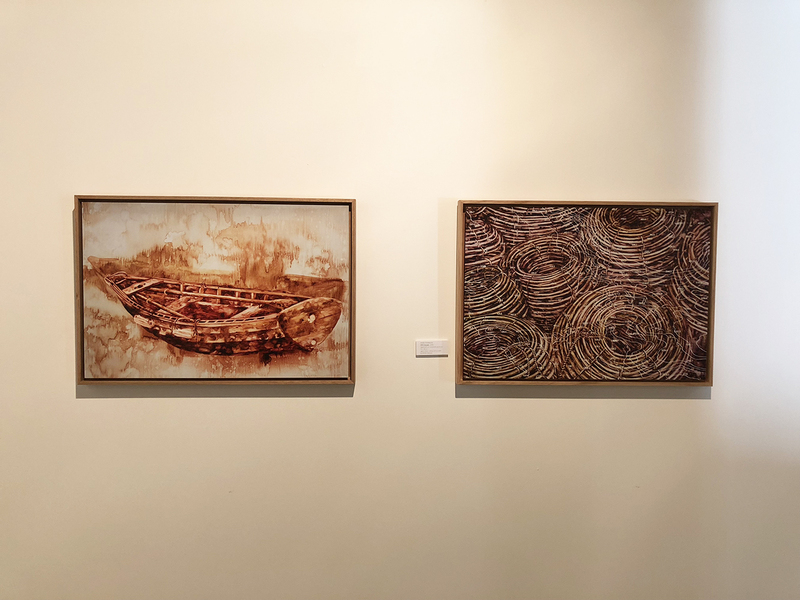 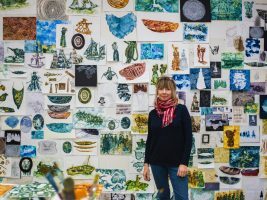 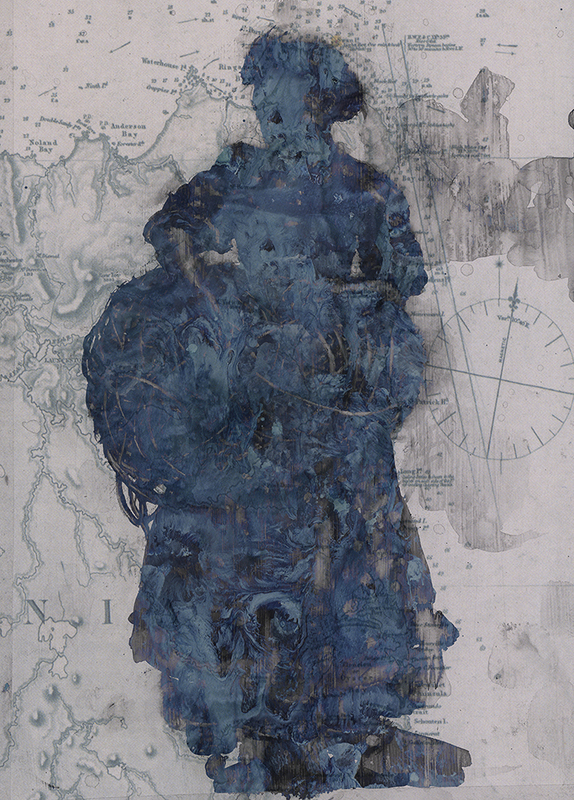 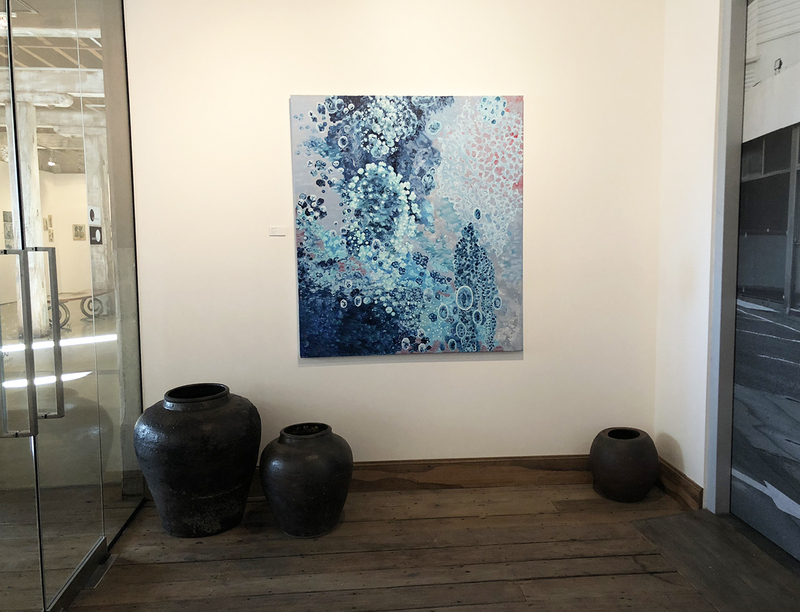 This exhibition is an extension and further exploration of ‘beneath the waterline’ a project carried out in 2017, where Morrison responded to the absence of female voices in Tasmanian maritime history, through exploring the collection of the Bass Strait Maritime Centre.